Based in Toronto, Canada, Bella Travel Group Ltd. (Federal Corporation number: 765324-7) is a full service travel agency that operates the trade names Authentic Cuba Travel Group (Ontario Registration number 251215125) and Hello Cuba Travel Group (Ontario Registration number 251215034). 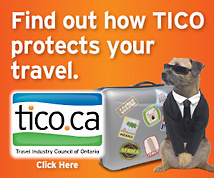 By booking your trip with a TICO-registered travel agency, you’re automatically protecting your travel investment. Established in 1977, the Association of Canadian Travel Agencies (ACTA), is a national trade association representing the retail travel sector of Canada's tourism industry. ACTA is an industry-led, non profit, membership based organization. Designed for travel agents and other tourism sales intermediaries, the Travel Industry Designator (TIDS) is a unique code that allows members to be recognised by industry suppliers all over the world. TIC Travel Insurance Coordinators Ltd., one of the largest travel insurers in Canada providing travel insurance since the mid-1960. RBC Insurance ® Youth/Student Group program is designed to provide comprehensive travel insurance protection for full time student groups and their chaperones. Coverage comes with a full range of benefits, including 24/7 global emergency assistance, baggage and personal effects insurance as well as upfront payment of eligible emergency medical expenses where possible so your group is not out-of-pocket. ASISTUR is the official Cuban insurance agency providing medical coverage for island visitors. ASISTUR organizes medical services and support across the nation for travelers as needed. Emergency response is available 24 hours a day. ASISTUR coordinates services with many major medical and insurance companies globally. As of May 1, 2010, all island visitors are required to have official ASISTUR Cuban health insurance policies in place prior to arrival. Authentic Cuba Travel is sanctioned by the Cuban Ministry of Tourism (MINTUR), the state governing ministry that regulates Cuba’s tourism industry. MINTUR establishes policies and guidelines and monitors their implementation in the tourist sector. All tour service providers (from hotel chains and restaurants to minor leisure and travel providers) are under the central management and directly regulated by MINTUR. Headquartered in Toronto, Canada, TD Bank has offices all over the world. In 2009, TD Canada gave more than $50 million to support not-for-profit groups in Canada and the U.S. As regulated by TICO, all client funds are held in trust at TD Canada U.S. and Canadian trust accounts until paid to our suppliers.